When an East German car with an ill-advised Subaru/Volkswagen drivetrain swap finishes mid-pack in a 24 Hours of LeMons race, those rusty Warsaw Pact hands tend to grab the Index Of Effluency trophy and hang on for dear life. 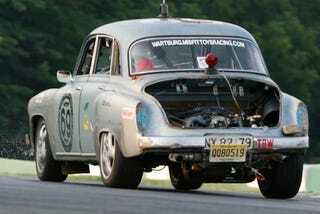 That's what happened here, with the Misfit Toys Racing 1958 Wartburg overcoming some early mechanical glitches and putting down many, many quick laps around Summit Point Motorsports Park in West Virginia this weekend. Next stop, the Grassroots Motorsports $2010 Challenge. Congratulations, Misfit Toys Racing! Disclosure: Murilee Martin gets paid crazy baksheesh for his work on the LeMons Supreme Court.